Short Brothers. (STAND 44) Whitehall House, 29-30, Charing Cross, London, S.W.1. The Sporting type seaplane is designed as a general utility machine. The functions it will fill are numerous, ДальшеMore>>> and for convenience can be described under two headings :- Military and Commercial. In the former case, accommodation is provided for pilot and three passengers. The seating arrangements are: the two front seats tandem fashion and provided with dual control, the rear seats side-by-side. Thus it will be possible to carry out tuition work not only in flying, but in gunnery, wireless, photography and bombing. For these latter, pilot instructor and pupil can be accommodated, plenty of room being provided in the rear seats for wireless, guns or cameras. The view from the rear seat is excellent, and good arcs of fire are obtained. For the above work the machine is fitted with a 160 h.p. Beardmore engine, as a high performance is not required and economy in fuel is very necessary. For War work, or where a higher performance is desired than that normally attained with the Beardmore engine, the "Siddeley Puma" engine of 240 h.p. is installed. This engine fits the machine without any alteration, this being one of the features of the design. In designing the Short Sporting type, great attention has been paid to the commercial side as distinct from the Military point of view. (1) The sporting man who wishes to purchase a machine in which he can learn to fly and take his friends for flights. (2) The experienced pilot who is desirous of running a passenger-carrying and tuition machine at a seaside resort as a commercial undertaking. (3) Companies owning factories, i.e. holdings on rivers and lakes who require a quick method of transport for their officials, and for light parcels and mails. The machine is designed on the standard lines of the Short seaplanes, and embodies all important details of construction which have been evolved during seven years of hard experience. Particular attention has been paid to making the machine safe in landing and getting off the water, and to achieve this object some reduction in the possible speed attained of a machine of this size and power has been made. A valuable feature in the design is that the machine is made to fold into small compass by means of the Short patent folding wing system which permits it being housed in a shed of very small dimensions. The actual size of the machine folded is 15 ft. wide by 33 ft. long by 12 ft. high. To beach the machine an axle is passed through prepared holes in the floats, wheels are attached each end, and the machine can then be handled by two or three men with great ease. To assist handling on the ground a detachable wheel is fixed to the tail post, thus allowing the machine to be swung round or manoeuvred in its shed with the greatest facility. The floats of the machine are built on the well-known Short principle combining great strength and rigidity with lightness. A feature of the design is the curved bottom of the floats. This ensures quick get-away, and minimizes the shock of landing, but is of particular importance when beaching the machine Owing to the curvature, the bottom of the float does not touch the ground, all the wear and tear being taken by runners which are attached to the sides of the floats. These act like skids and are shod with metal to give greater durability. The engine fitted for commercial work is the 160 h.p. six-cylinder Beardmore, it having been decided, after careful consideration, to fit an engine of known reliability and performance rather than install any of the newer, and as yet untried, engines of post-War design. 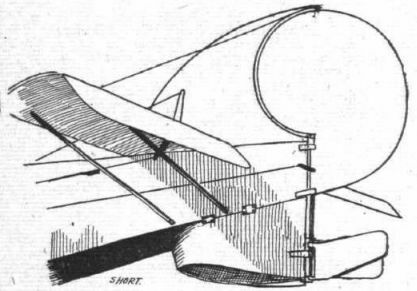 As one out of the three seaplanes exhibited, the Short Sporting type machine should receive its share of attention, even if it does not possess the novel features which make the "Swallow" the most interesting machine at the Show. Messrs. Short Brothers have had unique experience in the design and construction of seaplanes, and the sporting type follows, generally, the lines of their well-known war types. The machine is designed to carry four persons, three passengers in addition to the pilot. 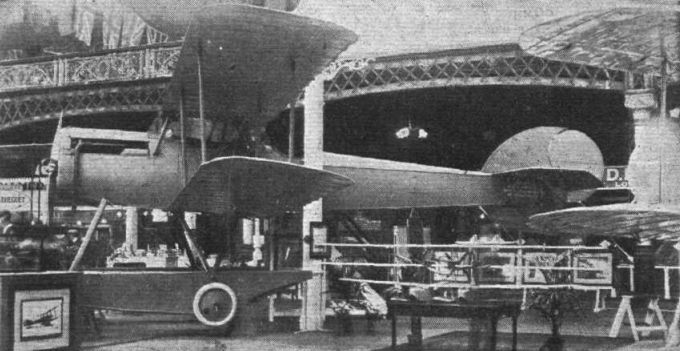 Two seats are arranged in tandem under the top centre section, while a side-by-side cockpit accommodates two more passengers slightly aft of the trailing edge of the wings. These are provided with the usual Short folding arrangement. This firm, incidentally, was the first to employ folding wings. Perhaps the most interesting feature of the design is the design of the floats. The old type Short floats, it may be remembered, were flat bottomed and cut off square at the heel. The floats of the Short Sporting model are tapered towards the heel, the portion aft of the step having a Vee bottom. In front of the step the bottom is hollow, somewhat after the fashion of the hulls of the Italian Savoia flying boats. The result is said to be that the machine gets off very quickly and with little spray, while for handling ashore the hollow bottom is a great advantage, since the bottom itself does not come into contact with the ground. The sides of the floats are shod with metal to give greater wearing qualities. As in previous Short seaplanes rubber shock absorbers are fitted inside the floats.